Click here for a link to our Facebook event. Click here to learn more about our cast. Click here for directions to our performance space. 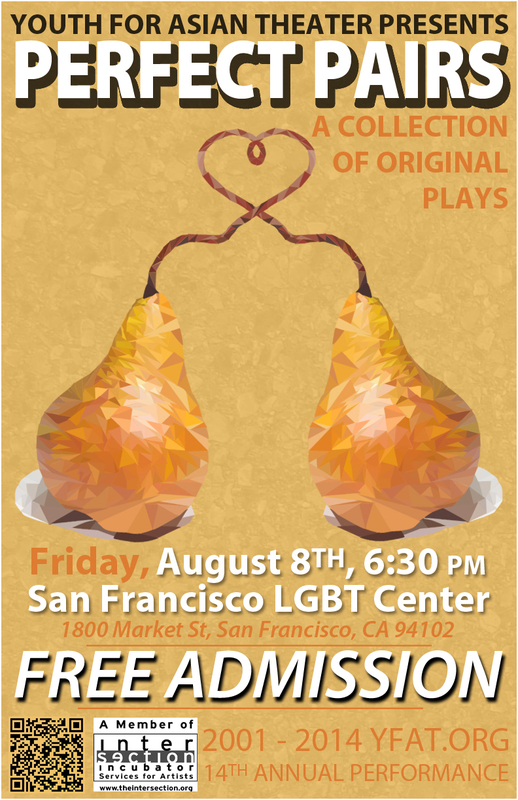 Friday, August 8, 2014 at 6:30 P.M.
Join Youth for Asian Theater for an evening of original plays written, directed, and performed by San Francisco youth. “The Whole of This Unfortunate Business” written and directed by Reyana Maguad. A comedic play, rated PG. This Austen-tatious play follows the lives of two groups of friends and their sometimes prideful, sometimes prejudiced interactions. “Close, But Not Santa” written by Denise Lam, directed by Jerry Ng and Claire Talbott. A dramatic play, rated PG. Watch as the wheels of this relationship go round and round, but will the traffic between Dianna and Lexy ever clear up? “It Takes Two to Fence” written and directed by Jesse Chung. A comedic play, rated PG-13. “In The Bag” written by Thomas J. Misuraca, directed by Joe Genolio and Laura Ziganti. A comedic play, rated PG. Teenagers Darren and Joanne get a stinky surprise when they open Darren’s locker after Spring Break. “Enter the Void, Watch Your Step” written by Teresa Ibarra, directed by Joe Genolio and Laura Ziganti. A dramatic play, rated PG-13. Outbound, inbound, it doesn’t matter where you’re taking the train when it’s the end of the world. “12 Professors” written and directed by Jesse Chung. A comedic play, rated PG-13. Teachers are like problems. It’s not that they disappear after leaving high school, they just become…different. Also featuring some improvised transitions from our wonderful actors and, no, the points don’t matter. Youth for Asian Theater is the only not-for-profit San Francisco theater company in which students operate all aspects of theater production. Thus, YFAT members are given the opportunity to develop into articulate and effective leaders. YFAT is absolutely free not only for actors, but for audience members as well, enabling us to reach a large part of the community not typically exposed to theater. YFAT is also the only San Francisco youth acting group that concentrates on the struggles of being Asian-American, a much-neglected subject in a city where the population is one-third Asian and local history is rich with Asian culture. Every summer, members rehearse rigorously for eight weeks at various locations in the community. Company also includes: Boris Alguliev, Caelan Noyes, David Yi, Francine Schneider, Hefan Zhang, Ivy La, Jane Liang, Jomar Villagracia, Nancy Chen, Naomi Louie, Shirley Chun, Zola Hanson.